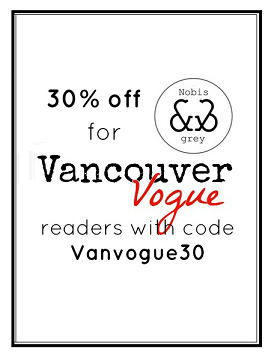 If you've been following Vancouver Vogue for a while now, you know I love to share great fashion deals with you. After all, dressing well doesn't have to cost a fortune. Thrifting is one way to do that...another is to win yourself a shopping spree! If you live in British Columbia, keep your eyes trained right here, because I have some VERY important info on how you could win a $50,000 shopping spree! So here's the deal: Daily Grand is a national lottery game that offers two unique top prizes: $1,000 a day for life, and $25,000 a year for life (and in case you're wondering, they actually mean for the rest of your life!). That would be pretty grand, wouldn't it? Now here's where you want to listen up, fashionistas! BCLC wants to give people who are 19 years and older a chance to imagine and experience living grand with a $50,000 Daily Grand Shopping Spree Contest. If you win the contest, you'll have four hours at Metropolis at Metrotown mall to spend that 50 grand on October 28th. My mind is already racing with all the things I would buy!! It just so happens fall is coming up, so I know my fall wardrobe would be 100% covered. I know you want to get in on this fabulousness, so here's where you can enter for a chance to win this crazy massive shopping spree: www.DailyGrandContest.com. Make sure to get those entries in by October 1st! But even if you don't win the grand prize, don't despair, because Metrotown shoppers like yourself will also have a chance to win secondary prizes on October 28th at Metrotown (which includes four $5,000 gift cards!!). Even $5,000 would go a long way to nailing your new fall wardrobe. Stay tuned, because I'll have another blog post coming up in October where I'll be sharing what I would buy on a small shopping spree. I'll talk shopping strategy, and when and where to choose between quantity vs. quality – that way you’ll be all set strategy-wise for your own shopping spree if you win! Can you even imagine having $50,000 to spend on a shopping spree?? What would be the first thing you would buy?